Selected from more than 5,500 images, I am delighted to let you know that my image Wagtail and Brown Bear was awarded Category Winner in Birds AS Art 1st International Bird Photography Competition. This competition is hosted by BIRDS AS ART / Arthur Morris based in Florida, U.S. The Jugde panel set up for this competition was Darrel Gulin, Tim Laman, Arthur Morris, Chris van Rooyen, Andy Rouse and Julie Zickefoose. The contest is open for both amatuers and professional photographers world wide, and focus only on bird photography. Totally there are 11 different categories, were my image won the “Small in the frame” category. I feel both humble and proud to receive such a prize. Please click on the image to enlarge and leave your comments below if you like. Here are the links to BIRDS AS ART blog and website. Category Winner in Birds As Art 1st International Bird Photography Competition. Nikon D3s, Nikkor 600/4 VR, 1/640 sec at f/5.6. ISO 3200. Husker godt situasjonen, som vanlig fikk du mer ut av den enn meg !! Gratulerer. Du begynner å få endel på CV`n din etterhvert. 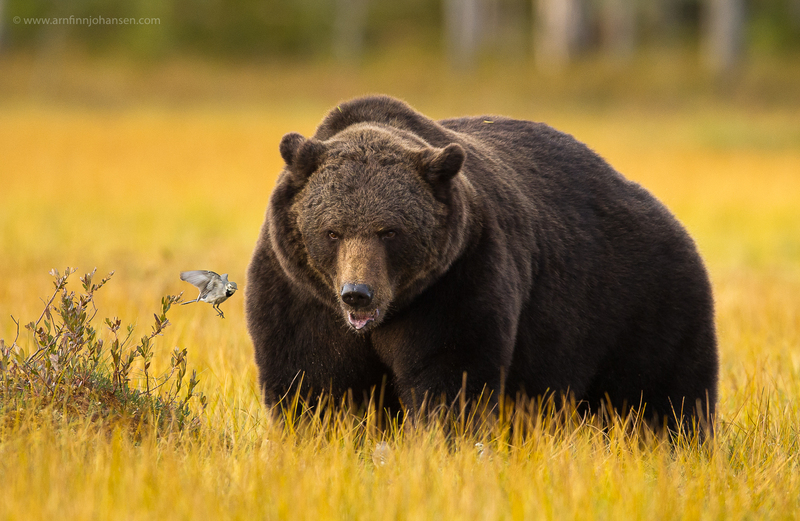 Congratulations Arnfinn Great capture and well deserved award, love the expression on the bears face. this is a wonderful feeling. But I guess this photograph must have been so difficult to execute, for it is just so insignificantly small in comparison with the bear that most would simply lose the sense of distance. you hit the aoerture just the right moment. Congratualtion. Keep it up. God bless. Many congratulations. That is indeed a great photograph and certainly deserved to be ranked as the best photograph. Fantastic shot, well deserved award Arnfinn!